Food Adventures of a Comfort Cook: Italian Tubular Feasting. If you think about it, many food items come in a tubular form; examples are hotdogs, bratwurst, taquitos, burritos, rolled crepes. In Italian cuisine, examples would be cannoli and many pastas such as ziti, penne and manicotti. I guess if you were a Freudian psychologist, you could come up with some type of fantastical sexual reasoning behind the use of this form, but I'm not even touching that here. So lets get down to the main focus of this blog post...Manicotti; a large tubular form of pasta, usually stuffed with cheeses, meats, veggies or a combination; covered in sauce and cheese, baked in the oven till tender. Hungry yet? 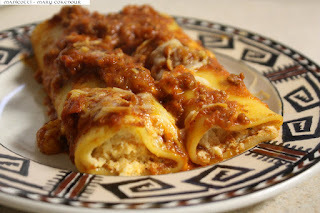 Manicotti can be a bit difficult to make as you have to be careful to not split the pasta when stuffing it. Package directions say to cook until tender, but as with shells, I pull them out of the boiling water when they are al dente. That way they are still a little firm, but flexible enough to stuff without breaking them open; they'll become tender after the baking process is done. Ok, lets get to the recipe and directions for this yummy meal. Bring a large pot of salted water to boil on high heat; cook manicotti for 10 minutes, or until al dente. Strain manicotti out and place in large bowl of cold water to stop cooking process and keep them from sticking together. While waiting for water to boil and pasta to cook, prepare the filling by place all remaining ingredients, except one cup of shredded mozzarella and the meat sauce into a large bowl. Use an immersion blender or hand mixer to smooth out the cheeses. Preheat oven to 350F; spray a 4 qt baking dish with nonstick baking spray; spread 3 cups of sauce over bottom of dish. Use a teaspoon or piping bag to fill each tube; place into the baking dish. Spoon remaining 3 cups of sauce over them; evenly spread the remaining mozzarella cheese over the manicotti; cover with aluminum foil. Bake for 30 minutes and let rest for 5 minutes before serving; serve 2 per person.